The Lincoln Memorial is the first memorial we visited as part of our visiting the memorials on the National Mall. It is a logical starting or ending point with it being the west end of the National Mall. There really is not a nearby Metro, though, which means walking a ways from Foggy-Bottom GWU (Blue and Orange Lines) or even walking across the bridge from Arlington National Cemetery (Blue Line). The Washington Monument (East End of the main memorial part of National Mall), however, is near Smithsonian (Blue and Orange lines, I do not like this elevator wise, as it is actually on the Mall like the escalator entrance and can be hard to find if you do not know the area) as is Federal Triangle (Blue and Orange lines, elevator is more obvious than escalator entrance) and Archives-Navy Memorial is only a little further away (Yellow and Blue lines, elevator quite near escalator entrance). 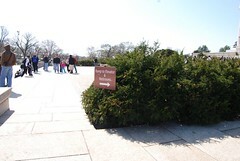 We did notice there are some wheelchair spots near the Lincoln Memorial, but they seem to easily fill, as it was not even that crowded when we visited, especially compared to how bad it can get in late Spring and the summer months. The Lincoln Memorial might appear to not be accessible from photos, but when you walk up to it from either side it is quite obvious that there are ramps up to an elevator, which is also where there are restrooms (not very accessible according to Mik's experience when with Mom). There is also a little exhibit area here, that I honestly never knew about until I first went with Mik to the Lincoln Memorial in 2006. The ramp up is not bad, but when you get to the top their are doors that do not have an automatic button. That is not the appalling part, though. The real annoying part is that they actually have a handicap symbol on them, which usually signifies it can be operated automatically somehow. However, no such luck and it just is an extra unnecessary symbol to tell you are going the right way for the elevator or at least that is the only thing I can think it means. Not too big of a deal, as Mom was with us, but it was still tough with there being a second door after a small entryway. Sure, if there are people around they tend to be helpful, but there is easily no one going this way on low crowd days/off season like we were on the tail end of. 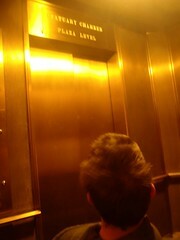 Mik was impressed with the elevator. It is not all that amazing, as it did not line up properly at the top and we had to tilt his front wheels up to get in. However, it is gold colored inside and sure seems fancy. It is a little odd that the doors are on adjacent walls, but it works about as efficiently as front and back doors in that you do not have to try and turn around inside the elevator if you roll in properly. We did not stay long up top at the Lincoln Memorial. We tried to go in the gift shop, but quickly aborted that, as it is extremely small. We knew that, but this time there were only a few people and we thought we would give it a shot, as Mik likes looking at all the books they have. However, it really only takes only one other person to make it too crowded for a wheelchair to be able to turn around to just get out. Unfortunately, this is also where you need to go to get the Lincoln Memorial stamp as well as stamps for other nearby memorials such as Korean and Vietnam Memorials. 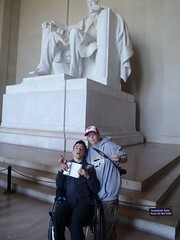 I ended up just going in and doing the stamps leaving Mik in the wide open main area of the Lincoln Memorial. Overall the Lincoln Memorial is pretty cool to see up close and it is accessible. 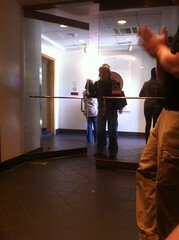 However, it has some wheelchair accessibility issues. The gift shop is not too big a deal, as it basically seems an afterthought and there is not anyway to make it bigger without messing with the memorial unless they put it in the exhibit area by the elevators and exhibit space is way more important. However, it would be nice if the stamp could be gotten at a little station right outside the shop or something like that. Also, it makes no sense at all for the doors into where the elevator and exhibit are to not have a button to open them automatically.